Status: Demolished – Admin restored after arson attack. The original Gloucestershire Asylum at Wotton had been extended a number of times and the subscribers with whom the institution had been shared had left for their own property at Barnwood House which opened in 1858. However the space provided still remained insufficient to meet the requirements of the County and City authorities and plans for a second county asylum were commenced. The Barnwood Mill Estate was purchased in 1878 and included a corn mill on the River Twyver. To the north stood the Barnwood House Asylum owned by the subscribers, to the west the Court Farm estate and Coney Hill Road, and bounded to the east by Upton Lane. 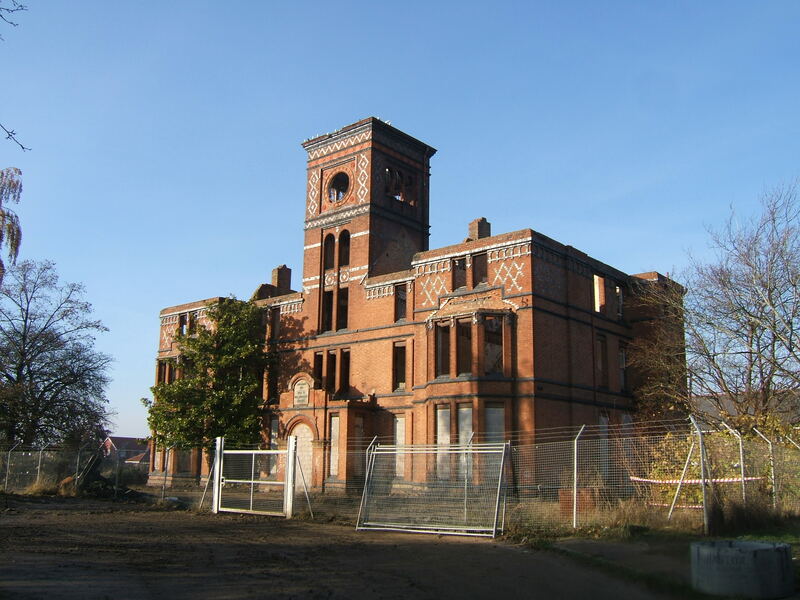 Plans were submitted for the design of the asylum via a competition and the architects of John Giles and Gough were selected. Giles and Gough were already established institutional architects having produced works for the Poor Law Unions, Metropolitan Asylums Board (as Giles and Biven) and as designers of County Asylum had already produced an experimental Corridor-Pavilion layout for the East Kent Asylum at Chartham. The design for the Second Gloucestershire County Asylum was to be considered even more revolutionary, being the first to adopt an echelon layout, itself derived from the pavilion plan. The male and female three storey ward blocks were to be arranged to either side of a central service and administrative area in pavilions linked to the main single storey corridor network by short spur corridors. Each block of the three blocks leading away from the centre was set back from the first, and otherwise fully detached from each other and set in their own airing courts. to the rear a further linear corridor crossed between male and female sides via the service area onto which two further ward blocks were sited. Each of the blocks was to be designated for a specific management class of inmate including, sick and infirm, acute and recent, working chronic and epileptics. The central service area comprised the administrative block to the south, providing a visual division between the wards. 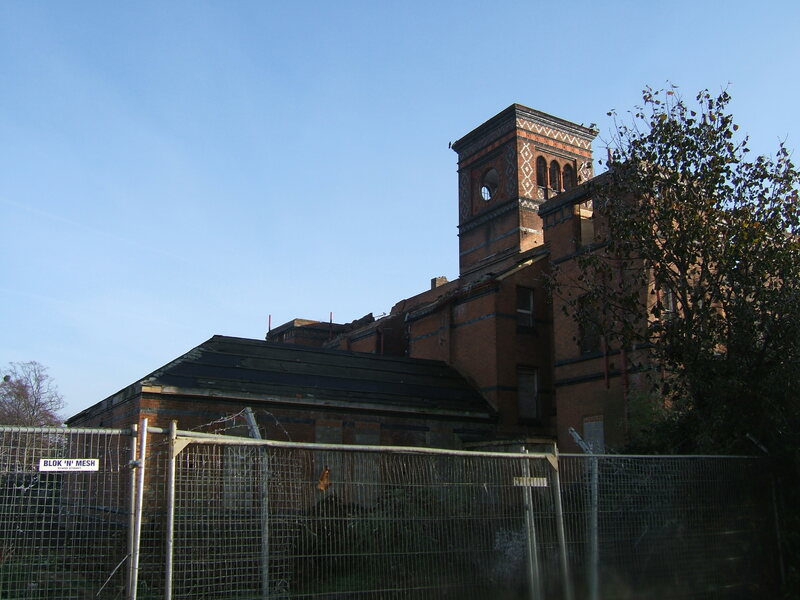 Behind this stood the recreation hall, kitchens and scullery, central stores, power house and gasworks with gas holder. To the west stood the workshops, whilst to the east was to be located the laundry and sewing room. Each had was located conveniently for those accommodated in the epileptic and working chronic blocks to find useful occupation. Each block was constructed with red bricks, with the uppermost level decorated with blue brick diapering giving a tudor appearance. The diapering extended to the clock tower and water tower, the latter also featuring lancet windows. Roofing on the original blocks was predominantly slate. 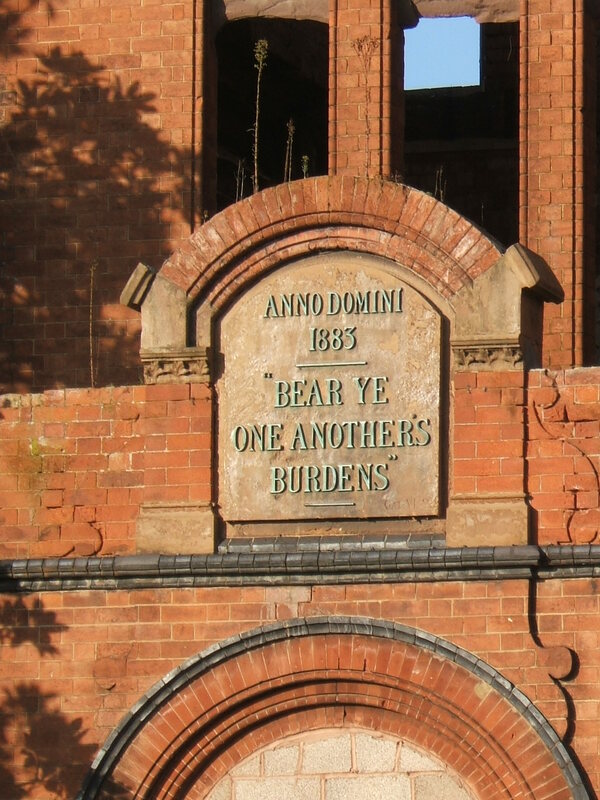 Above the main entrance porch the legend “Anno domini 1883 “, “Bear ye one another’s burdens” was embossed onto a stone tablet and provided a prominent feature of the administrative block. 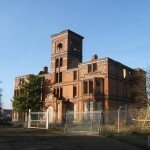 The building of the asylum was to be constructed in phases, the first commencing in 1881and remained incomplete at the time of opening in 1883, with building work completed in 1885. The county decided to only initiate construction of a small proportion of the scheme which included the administrative and service areas with the two southernmost flanking wards and one next to the workshops being built. The anticipation was that the remaining outer sections would follow as need and finances permitted and the land remained set aside for many years. Elsewhere on the site development was limited to the modification of the farm and the construction of pairs at lodges at the gates onto Coney Hill Road and Upton Lane. 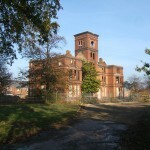 The planned echelon complex was never implemented at Coney Hill, but similar complexes were designed and built by other architects at Menston, for the West Riding of Yorkshire’s third asylum, the County of Glamorganshire’s second asylum at Parc Gwyllt and the male annexe at Coxlodge, Newcastle upon Tyne. Subsequent echelon layouts evolved following George Hine’s plan for Claybury Asylum for the London County Council where blocks were realigned and modified to be much more closely spaced and in some cases interlinked which reduced distances between buildings and the required land-take. The modified layout became known as the compact arrow plan. with the earlier, more dispersed echelon asylums, known comparatively as the broad arrow plan. 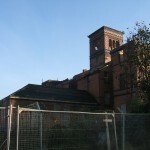 Instead of operating as an independent institution, Coney Hill’s undeveloped site meant that it was operated as an annexe of the First County Asylum at Wotton. The Superintendent remained located at Wotton and the magistrates covered both sites. Some of the new accommodation at Coney Hill was set aside for private fee-paying patient’s whose costs could be offset against the costs of the upkeep of the pauper population. Coney Hill had the advantage of remaining in an undeveloped, rural location with attractive views and modern wards whilst the Wotton site had been largely been encircled by Victorian developments and was already 60 years old at the time Coney Hill opened. Out of county inmates were also accepted from other counties in space not taken up by Gloucestershire paupers. These also provided further additional revenue, with the authorities purchasing the capacity paying a substantially higher rate than the local guardians to accommodate pauper inmates there. 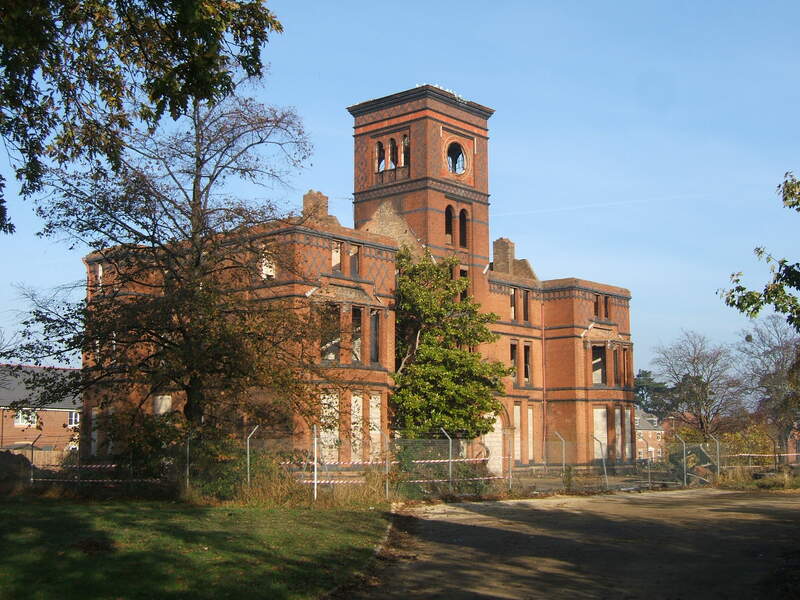 At this time the combined total of the two asylums had reached over 1,000. Extensions to the complex took place at Coney Hill in 1906-9 in echelon form, albeit not to the original plan. The new block was sited on the female side to the east and formed a block for working chronic and epileptic inmates. to either side of the connecting corridor. The Great War meant the release of the Bristol City Asylum at Fishponds for military casualties as the Beaufort War Hospital and the population of that institution was evacuated to others in the same group including Coney Hill. These inmates were not returned until the hospital was handed back to the Bristol Corporation after closure in February 1919. Similarly the Bristol’s new mental hospital at Barrow Gurney was evacuated during World War II. Each War had resulted in overcrowding as Bristol patients needed to taken into institutions which were already usually full, with a corresponding reduction in male attendants who were enlisted in the military. During the interwar period the Gloucestershire institutions followed the convention of others in England and Wales and discarded the term Asylum in favour of Mental Hospital. Coney Hill was expanded further with a unit for voluntary patients in 1934 following the act of 1930 enabling patients to enter mental hospitals without the requirement for certification. Unlike at other mental hospitals where substantial admission and treatment complexes were built, a basic receiving block was provided as part of the main building. Verandahs were also added during this period to the front pair of original ward blocks. From 1948 the hospital became part of the National Health Service along as Coney Hill Hospital under Joint management with it’s sister institution which had become Horton Road Hospital as a joint hospital management committee. Under this management a new villa block was added in 1956-60 on the male side and linked to the corridor system. The villa was typical of those developed by the South Western Regional Hospital Board and differed substantially from the other structures at the site. An extension was also added to the 1909 block on the female side. 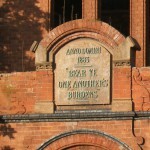 A day hospital followed in 1958 with the purchase of a building at 18 Denmark Road for the purpose. Under a directive from the Ministry of Health, the farm was closed and the part of the land was subsequently sold in 1963. A new boiler house and engineering department was constructed to the rear of the hospital to replace the existing ageing facilities. The hospital management committee was merged with the Gloucester, Stroud and Forest HMC who were responsible for the area’s general and maternity hospitals, until this too was reformed in 1974 with the creation of the Gloucestershire Area Health Authority. A new block for mentally handicapped patients was built at Coney Hill to the male side of the hospital, and named the Twyver Unit after the nearby river. Prior to this time much of the mental handicap services for the area had been located in Bristol or further afield as Gloucestershire had been reluctant to construct dedicated facilities outside of those provided by the counties’ public assistance institutions. Further pairs of staff housing was also constructed on West Lodge Drive. By 1981 the combined population of Coney Hill and Horton Road Hospitals was approximately 900 patients, having been reduced through the increase of community provision and the development of acute psychiatric units in the counties’ district general hospitals. Further land was sold in 1983 to the south west of the complex and used for the construction of the Abbeydale housing estate. 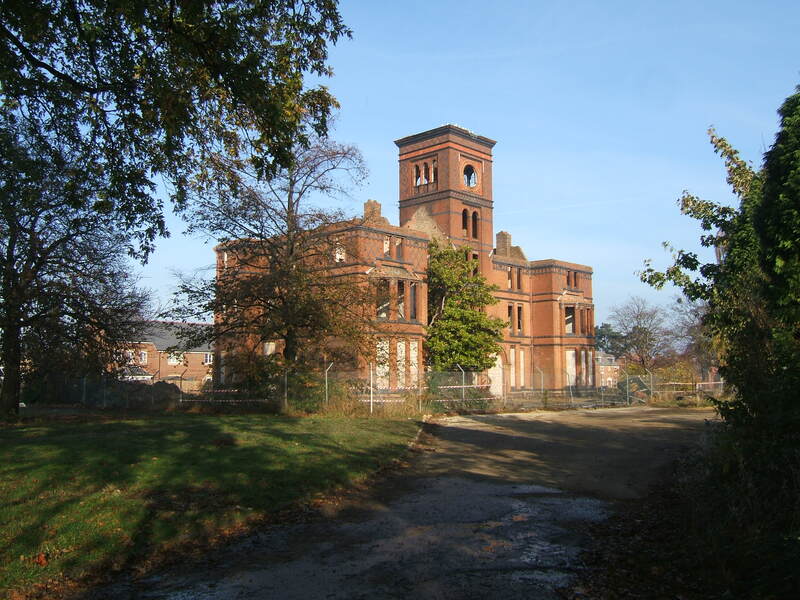 Coney Hill remained in use for 6 years after the closure of Horton Road Hospital but closed on 31st December 1994. 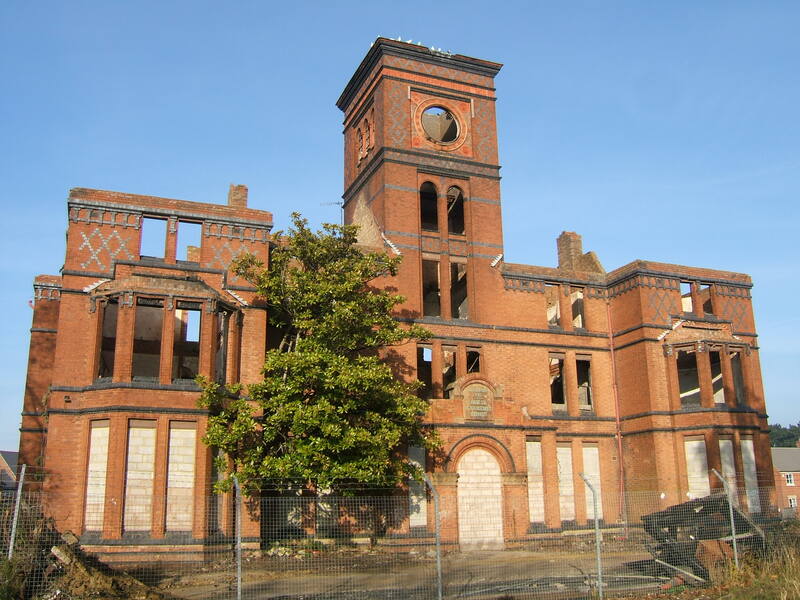 After closure most of the complex was demolished with the exception of the administration block and housing was constructed on the surrounding land and was subsequently gutted by fire in 1999. 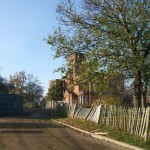 Since closure, little remains of Coney Hill Hospital. The lodges, staff housing, farm, ward blocks and the Twvyer Unit have all been demolished. The entrance gateway from Coney Hill Road is no longer recognisable as such and now forms part of the road junction providing access to the housing estate. 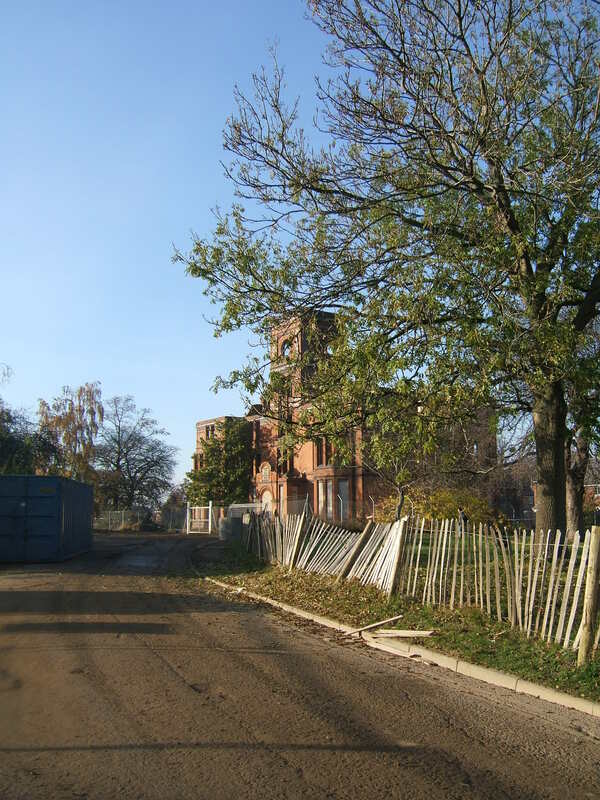 On the east side of the site, Upton Lane no longer exists, having been superseded by new access roads for the surrounding housing and the boundary of the hospital site is no longer defined in this area. Parts of the driveway approaching the administration block and surrounding trees remain as an indication of how the grounds appeared. The administration block itself has been renovated as housing and sympathetically restored to it’s former grandeur. 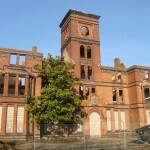 None of the internal structure remained having been gutted by fire and a new extension has been added behind on the site of the link corridor and recreation hall. I was the Catering Officer at Coney Hill and Horton Rd Hospitals around 1968 for a two year period. We lived in a house on the estate. I have many memories of the hospital, its patients and staff. Hi Ken – that’s interesting – well if you ever find the time to sit down and type up some of those memories, we’d love to see them posted here! Always very happy to hear people’s stories from first-hand experience! Have many happy memories as an inpatient at Coney Hill Hospital but a few very sad ones. Was very sad to hear it had been demolished.